Is food intolerance an inborn error of metabolism? Since Feingold hypothesised that chemicals in food caused hyperactivity in 1973 th1s issue has been controversial. Well planned research in the 1980’s did show some children reacted but the mechanism is complex. As well as Attention Deficit Hyperactivity Disorder [ADHD] symptoms improving, mood and physical allergic symptoms improved on a low suspect chemical diet. On this basis some have proposed an immunological component in the mechanism. However the whole foods commonly causing allergic reactions are additional exclusions in some individuals rather than the core exclusions of suspect additives and natural chemicals. To add to the confusion some of the symptoms which respond to diet include headaches, migraine, irritable bowel syndrome [IBS], mouth ulcers, and carsickness which are not allergic symptoms. The fact that symptoms responding were in many of the body’s systems meant that several possible mechanisms have been proposed but none clarified. 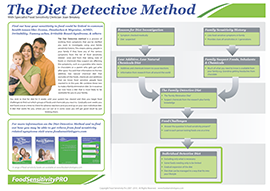 Yet another mechanism was proposed with the use of a gluten and casein free diet in autistic children. Peptides from these proteins are absorbed and thought to act as opiates affecting brain function. However those using this diet also exclude additives, chocolate, MSG and other small molecular weight compounds. An intriguing aspect of dietary response in the ADHD research was the finding of a reduction in halitosis [bad breath]. This author has also had patients report a reduction in breath and also in body and urine odour. Since most of the suspect chemicals are aromatic in structure the possibility of their poor metabolism arose. This was supported by the finding that similar enzymes are involved in the metabolism of both the suspect phenolic compounds [additive colours and flavours, salicylates and the benzoate preservative] and the amines. These are the sulpho transferases. Amines were reported to be degraded in the gut and phenolic compounds in the kidney. Work with diet-responding autistics in the UK has reported relevant findings that implicate sulphur metabolism. These autistic children have shown reduced levels of plasma sulphate, and increased levels of excretion of sulphate, sulphite and thiosulphate in their urine compared to controls. Sulphur oxidation appears to be abnormal in this group. The numbers of slow metabolisers or null metabolisers of cysteine dioxygenase in autistics is much higher than the normal population. A study of non-autistic food intolerant patients showed similar biochemical abnormalities. In clinical research it has been found that foods are better tolerated if flavour is mild, and more adverse reactions occur to foods which are highly flavoured, so a defect in management of aromatic compounds is indicated. The research implicating a defect in the metabolism of phenolic and amine compounds provides evidence of a possible mechanism. Presentation at the Nutrition Society of Australia Conference 2008.